Monofilament Equivalent Diameter 2 Lb. Please use caution when attempting to break this line when snagged. Due to the small diameter of this line it is razor sharp! 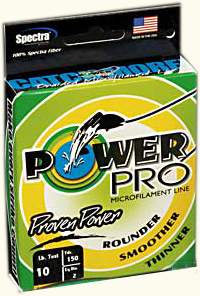 Power Pro offers incredible feel for even the lightest bites. Due to it's incredible strength it allows you to pull free of most snags without breaking.